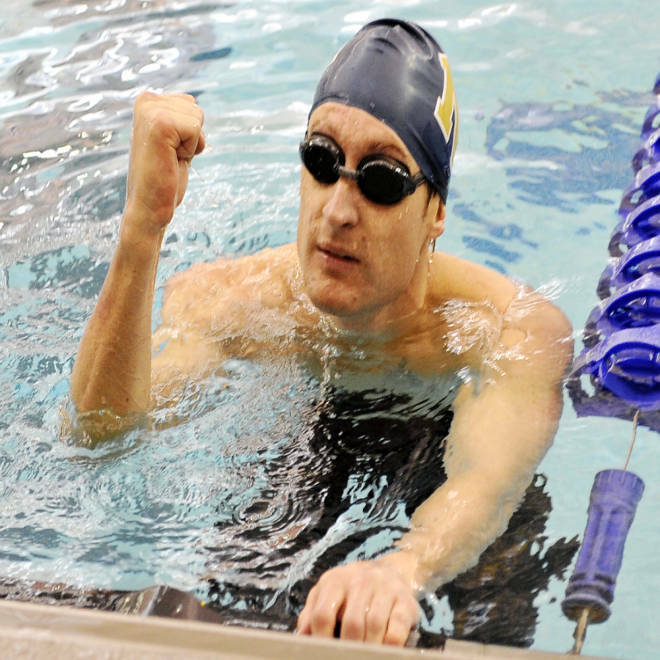 Exactly one year after losing his sight in Afghanistan, Navy Lt. Brad Snyder earned a gold medal in the 400-meter freestyle at the 2012 Paralympic Games in London. For one final, terrifying moment, Navy Lt. Brad Snyder could see. In fact, the last thing he ever viewed — one year ago today — was his two intact arms and his two attached legs. After stepping on a hidden bomb in an Afghan farm field then feeling the raw heat of the blast burn his face and hurl him backward, Snyder’s first instinct was to look down and inventory his body parts. 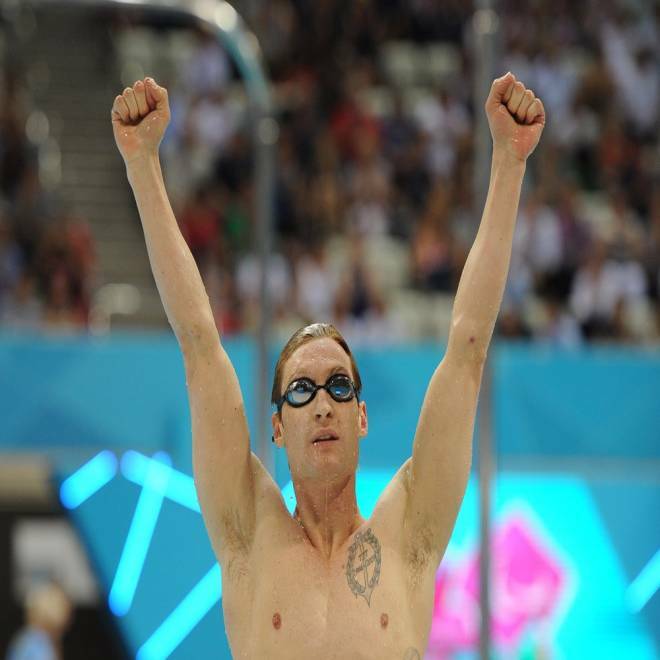 Today in London, with that dark anniversary in mind, Snyder dived blindly into a pool and sprinted away with gold – earning his third medal (two golds and one silver) at the 2012 Paralympics. At the close of the 400-meter freestyle final, Snyder cruised into the wall nearly six seconds ahead of the runner up, Spain's Enhamed Enhamed, who took silver. "It's not a poor anniversary and I'm really looking forward to celebrating how far myself and my family have been able to come over the past year," Snyder said from the Olympic Aquatics Centre pool deck. "It's a special night for all of us, (including friends and family who cheered from the stands). We are going to look at this evening as a celebration. A celebration of conquest if you like. We are all happy to be together, being in London and enjoying the experience." Snyder finished the race in four minutes, 32.41 seconds, a personal best. But it was a larger span of time — 365 days — that truly occupied his thoughts and fueled the best race of his life. And he swam for love: “My support network really came to bat for me when I was down. My mom, my brothers and sister were at my side. My Navy friends demonstrated their commitment to me. So I feel an obligation to reciprocate that commitment, to show them I appreciate the love. I want to prove to them — and myself — that I can experience success on a level I experienced before, even though I am now blind. His mother, Valarie, witnessed her son's golden swim while sitting with her other two sons, her daughter, and Valarie’s sister — the same group that surrounded Snyder’s hospital bed near Washington, D.C. when a doctor told him no surgery could restore his shattered eyes. In fact, those eyes later were surgically removed and replaced with prosthetics. When she watched her son compete — as he once did for the Naval Academy swim team — Valarie knew she would be “weeping,” she said, while she measured the massive ground Brad already has gained in 12 months. But she also reflected on how this journey began for her: with a horrifying phone call last Sept. 7. At 5:30 a.m., the ringing phone read “unknown number” on its screen — the same message that showed up each time Brad called home from his base in Afghanistan. But he typically called her at 11 a.m.
She did, though. And her son’s commanding officer revealed to her that an explosion had hit Brad in the face, that he still had all of his extremities and that he was then in surgery. Not long after she was reunited with her wounded son at a stateside military hospital, he reassured her that his life would continue without sight. And what the woman saw today in the London pool only reinforced that sunny outlook, she said. It was Loeffler who realized — while first perusing the Paralympic swimming schedule — that Snyder would be competing in his best event one year to the day after losing his vision. Snyder, ironically, visualizes each of his swims beforehand, using the mental images he has concocted for the pool, the lane lines and the crowd. The tactic allows him to feel that every race is already familiar. Lt. Brad Snyder lost his sight in an IED explosion in Afghanistan last year. The Navy officer will once again represent the U.S., this time at the London 2012 Paralympics in September. Prior to today's race, he saw himself walking across the pool deck toward the block, standing above his assigned lane as his name was announced, then feeling the surge of competitive juices rise inside. A gold medal is what he glimpsed in his mind. And if only for four furious minutes, his new life as a blind man faded as a constant reality.